In past weeks, the governments of Ecuador and Bolivia moved to shut down or expel major NGOs (non-government organizations) that work on issues of the environment, extractivism, and indigenous rights. In Ecuador, the Ministry of Environment dissolved the Fundación Pachamama (Pachamama Foundation) after accusing it of anti-government activities. Despite the NGO’s own denials, President Rafael Correa alleged that the organization was involved in protests against the latest round of bidding for oil concessions in the Amazon. Shortly thereafter, the Interior Ministry’s Twitter feed announced tersely, amidst reports of drug busts and other police actions, that it was moving to close the NGO for “aggressions” against public order. Fundación Pachamama works with indigenous organizations contending with oil development. It derives significant support from the U.S.-based Pachamama Alliance, which is in turn funded primarily by American (non-governmental) donors. When Ecuador’s government deemed the group’s opposition to oil bidding an action against “internal state security” and “public peace,” it treated the NGO like a criminal, sending a signal to environmental activists about limits on opposition to extraction. Yet the Correa government maintains that their dissolving of the organization is an assertion of sovereignty against the political meddling of foreign-backed organizations. 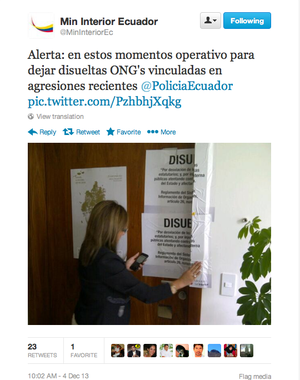 (Incidentally, see Naomi Klein's open letter to Correa following the threatened closure of another NGO, Acción Ecológica, in 2009). A few weeks after Ecuador’s closing of Fundación Pachamama, the Ministry of the Presidency in Bolivia announced the expulsion of the organization IBIS, a kind of parastatal NGO supported primarily by DANIDA (Denmark’s government foreign development agency). IBIS has long worked with indigenous organizations in Bolivia, supporting land reform, bilingual education, and the right of “prior consultation.” The MAS government accused IBIS of injerencia política (political meddling), though it published no allegations of specific actions. It appears that the government was punishing the NGO for having weighed in on the side of CONAMAQ (an Andean Indigenous organization) and CIDOB (an organization of Eastern Bolivian Indigenous Peoples) in recent conflicts with the state. For the MAS government, these critiques of state policy seem to have gone too far. Are the governments of Ecuador and Bolivia simply establishing limits for foreign entities, and thus reasonably asserting sovereignty against foreign intervention? Or, is this a deleterious move against social movements and democracy through an attack on their bases of foreign support? The NGO (non-government organization) is a flexible entity whose existence has been central in the rapidly transforming politics of extractivism and social movements in Latin America. Almost invariably, where there is mobilization around land and nature, there are NGOs. NGOs provide legal expertise for leaders and resources to bring communities together; they facilitate engagement between movements and outsiders, whether scholars, solidarity activists, industries, or the general public; the best NGOs disseminate news, information, and research, all part of complex political practices that go beyond their ostensibly ‘development-oriented’ origins. In an emblematic case, indigenous and human rights NGOs in Bolivia, many backed by European progressives, played a crucial role in supporting the rise of Evo Morales and the MAS. Even so, just as government dependence on foreign capital can erode national sovereignty, movement dependence on foreign aid can weaken the political legitimacy of a movement, raising important critiques around foreign intervention. From a structural level, even progressive NGOs have goals of institutional survival that may undermine local movements. Other NGOs, more frequently in the model of the think-tank, are fronts for conservative ideologies, operating much like U.S. non-profits. When they receive support from American entities like USAID (U.S. Agency for International Development) or the NED (National Endowment for Democracy), NGOs particularly in Ecuador and Bolivia face critiques of complicity in foreign intervention, given the U.S. government’s broader intentions to weaken Correa and Morales. These, at least, are the reasons Bolivia’s MAS gave for the expulsion of USAID from Bolivia earlier this year, and they likely underlie USAID’s announced withdrawal from Ecuador. Whether IBIS and Fundación Pachamama are shown to have played some interventionist role remains to be seen. While Fundación Pachamama is tied closely to the United States and has been involved in large-scale projects in which USAID also participated, so have virtually every other NGO and indigenous organization, as well as many state and private entities. According to its director, Fundación Pachamama has never been funded by USAID. The expulsion seems to be a warning that comes on the heels of “Executive Decree 16,” a law passed in June of 2013 that set new rules for civil society organizations and social movements. Fundación Pachamama is appealing the decision in the courts. In the case of IBIS, the Danish-funded organization has an almost three-decade history of what by all accounts is popular solidarity; Denmark is not known for imperialist meddling. IBIS did take a strange turn when it embarked on an experiment to train locals in high-end Andean gastronomy with a Danish cook in La Paz. Yet IBIS’ proximate sin may be its strong stance on free and informed prior consultation. In Denmark, where the public and the government have long advocated for indigenous rights, there is still surprise and general confusion about this announced expulsion. As noted by Bolivian Indigenous leader Fernando Vargas, it is paradoxical that Evo (and for his part, Rafael Correa) were products of NGOs themselves. In a public statement on December 24, Vargas said: “The NGOs took Evo Morales into power…now he’s throwing them out…because he does not want anyone to aid us technically, to orient us, so that [now] we thus have to subordinate ourselves to the Government.” Adding salt to the wound, the MAS government is celebrating the environmentally noxious spectacle of the Dakar Rally, with its motorcycles and racecars that will roar through the high Bolivian Andes in mid-January. Activists and movements might use the expulsion of Fundación Pachamama as an opportunity to reflect on the limits of foreign dependence, potentially hindering the strengthening of cross-movement political ties with other sectors of Ecuadoran and Bolivian society. Conservative observers will relish this chance to criticize Bolivia and Ecuador. For different reasons, the state of NGO activity is less stable in countries like Honduras and Colombia, both under U.S. tutelage, where activists are routinely murdered for their support of human and community rights. Bolivia and Ecuador, comparatively, are safer places for NGO work. In the United States itself, the situation carries its own nuances: while our government would surely move quickly to restrict foreign aid for Native American opposition to extractivism, many American citizens currently face repression of their activism because of their opposition to fossil fuels. Invoking the notion of sovereign control over foreign NGOs on which movements depend, the governments of Ecuador and Bolivia enact a double standard: they exercise ‘sovereignty’ in order to guarantee privileges to other foreign entities upon which they themselves are dependent—namely, foreign oil and gas industries. Often through executive decree, these governments are rewriting the law to appease the contractual terms and time frames of exploration, drilling, and commercialization demanded by foreign companies. The crackdowns undermine citizen rights in favor of industry rights: once the state deems extraction inevitable and legal, it can brand even moderate citizen opposition as outside the law. Whether this happens under right-leaning or left-leaning governments in the Americas—or in Pennsylvania, Oklahoma, or the tar sands fields—is immaterial. As Timothy Mitchell argues in Carbon Democracy, a government dependent on a narrow-based fossil fuel economy tends to rely on narrow-based legal and political orders—in other words, the erosion of democracy. Bret Gustafson teaches anthropology at Washington University in St. Louis. Among other concerns, he studies the politics of energy and redistribution in Latin America, with a particular focus on Bolivia, Brazil, and natural gas.